Last night’s game against the Chicago Bulls was billed to be the stiffest exam for the Sixers during this surprising season. They passed with flying colors with time left in class. 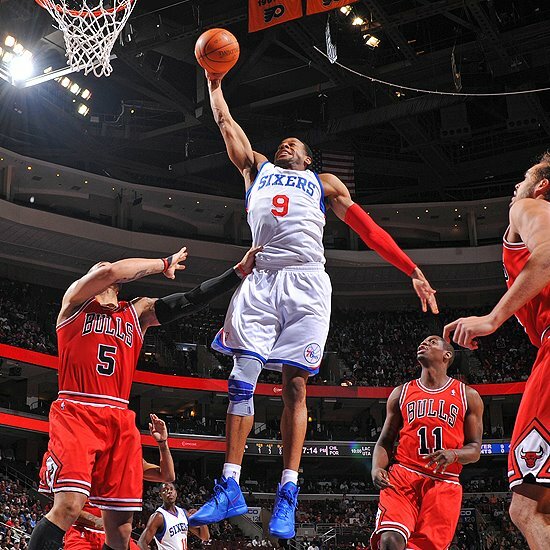 The Sixers routed the Bulls 98-82 behind a stellar performance from Andre Iguodala and another third quarter outburst. Spencer Hawes and Nikolai Vucevic did not play again, but weren’t needed as Sixer rook Lavoy Allen had the best game of his young career, notching 15 points and 6 rebounds while logging 26 minutes. I will say this again: Allen has earned plenty of minutes even when Hawes and Vucevic are ready for action. The Eagles could use some of the Sixers draft talent for their upcoming draft, as both rookies have contributed mightily this season. Chicago played without starters Rip Hamilton and Luol Deng, but still had reigning MVP Derrick Rose in its arsenal. Rose was held to 18 points as he was guarded by Holiday and Iguodala most of the night. Jodie Meeks was limited to 3 points and 13 minutes, probably due to his lack of defensive effort against Kyle Korver at the beginning of the game. Evan Turner stepped in and stepped up the defensive effort against Korver as he struggled the rest of the game. The Sixer defense was swarming all night long, collecting 10 steals and forced 17 Chicago turnovers. A 16-4 Sixer run in the 1st quarter was fueled by active hands and hustle on the defensive end to set up easy shots. This was a huge win for the Sixers as they await the Miami Heat in a rematch on Friday night. Miami lost to Milwaukee tonight even with LeBron scoring 40 points. Philadelphia is currently 5-1 during a 7 game home stand and will travel to Atlanta for a tilt Saturday night. It’s quite clear that the Sixers can be real contenders in the East this year. With a healthy Hawes and Vucevic, this is a legitimate 10 man rotation that can impact a game. It will tough for teams to gameplan for the Sixers as any of these guys can go off at any moment. I think a win over Miami would be the best thing for the Sixers right now. After the drubbing they got in Miami, and losing to them in the playoffs last year, it would be a good experience and attitude boost if they can take down Miami full strength. With the win the Sixers move to 16-6 on the year and own the 2nd spot in the conference due to tiebreakers. Boston is 4.5 back of Philadelphia in the East as they are beginning to play great basketball and better defense. Boston beat Toronto 100-64 last night. The Sixers and Heat tip off at 7PM Friday night at the Wells Fargo Center.